Besgrow Coirliners will help you create natural and attractive hanging baskets. Easy, practical and appealing Coirliners fit directly into hanging or wall basket frames. 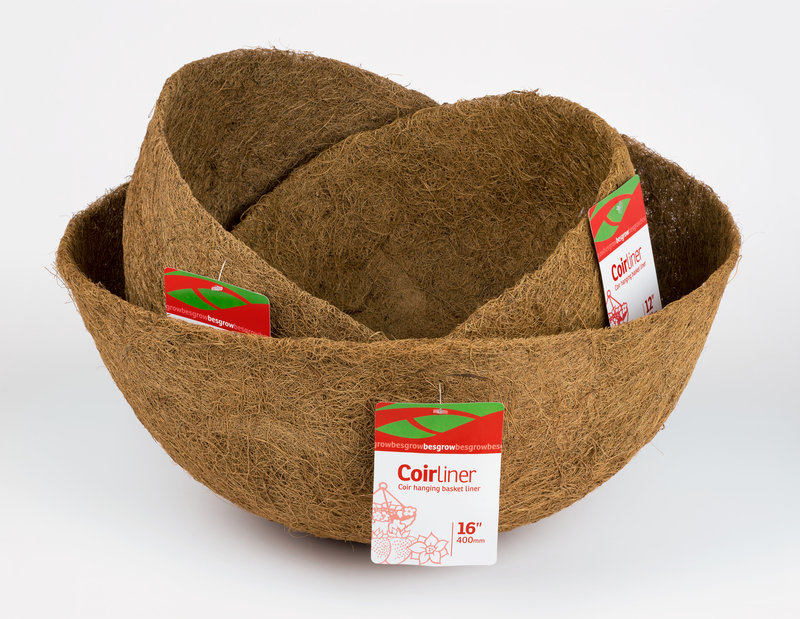 Coirliners are produced from the long fibres of the coconut husk bound with biodegradable natural latex. Besgrow have added a thin layer of plastic inside the bottom of the liner which creates a built in water tray allowing the liners to retain more moisture. All you need to do is insert the liner into the basket, fill with potting mix and add plants. Make sure you water regularly to keep the baskets damp. Besgrow Spagliners are perfect to use inside Besgrow Coirliners to create beautiful hanging baskets that you will not have to water as often. Round hanging basket liners are available in: 12”/300mm, 14”/350mm and 16”/400mm. Wall hanging basket liners are available in: 14”/350mm and 16”/400mm. Hanging baskets are great for decorating verandas and porches or to brighten areas of your home and garden. Hanging baskets don’t have to be restricted to just flowers, try growing strawberries, vegetables or herbs.